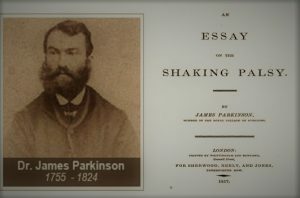 If you open almost any article on the Internet about James Parkinson, the physician after whom Parkinson’s disease is named, you will see this picture. A middle-aged man with beard and moustache. But if you’re trying to trace the picture back to its source, things get a little more complicated. This may well be a picture of a James Parkinson but it is emphatically not a picture of the James Parkinson. How do we know this? Very simple really. All we have to do is look at the bare facts of James Parkinson’s life and that of the history of photography. James Parkinson was born on April 11, 1755 in Shoreditch. His most famous work “An Essay on the Shaking Palsy” was published in 1817 (hence this gloomy bicentennial). But most importantly for this issue, James Parkinson died on December 21, 1824. So what, I hear you cry. The problem is quite simple. 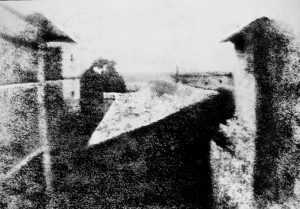 The very first recorded photograph (shown here) was taken by Joseph Nicephore Niepce at Le Gras in 1826. That’s two years after James Parkinson died. The first photographs in Britain were taken by William Henry Fox Talbot in the 1840s. It’s probably impossible to say with confidence who the bearded man is. But we can say with confidence who it isn’t. Parkinson’s disease presents many challenges. It’s not always easy to identify the condition in new patients. It also appears to be difficult to identify the man himself. Copyright © 2019 Jon Stamford. Powered by WordPress. Theme: Spacious by ThemeGrill.